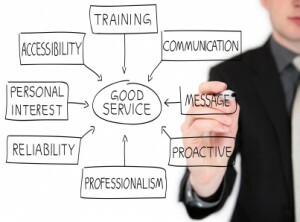 Although it is one of the most neglected parts, the customer service is actually one of the most important elements of a business, and its development and growth are inseparable part of every company’s way towards success. The statistics are devastating, according to a recent survey 78% of customers refuse to make an intended purchase, due to bad customer experience or rude service. Yes, even a firm decision for a purchase can be shaken (or downright changed) when met with unprofessional or rude service. However, most of the time customer service doesn’t get the financial or operative support it needs to work at its best. This is a fact, mainly because of the discrepancies in defining a good customer service. In most companies, a good customer experience means picking up the phone on time, which is a good starting point, but is the same as saying someone is a good pilot, just because he has seen an airplane. So, such companies almost never provide financial support to their customer service team. But the truth is, the customer service department, including its agents and managers, deals with a lot of challenges, which defy the future sales stability of the company, customer retention and the company’s image as a whole. It develops skills for cross and up-selling, as well as working closely with the sales team to secure more sales. All this is a sign of a professional service department, but for this you need a professional team. And such team is created with frequent trainings. Those trainings need to be periodical and diverse – webinars, e-training modules, live trainings and, of course, coaching, in order to achieve maximum results. Hiring a professional company, which will provide the training, increases the possibility of developing your customer service. To achieve this you need the financial support of the management. And in order to receive such support, you have to show, that the customer service team is a vital part from the company and is as important as the sales team or any other department. You have to be able to “sell” your customer service team. Show such data to your management and explain the challenges you meet in the process of developing and training your team. Show statistics presenting the relation between good results and periodical training. Prove that good customer service ads value and the support from the management won’t be late. As we’ve mentioned, in order to achieve maximum effectivity with your customer service, you need to train your department often. And what better source of development than a professional company providing such trainings? Check out our online training services and give us a call, so you can take advantage of your customer service department as soon as possible.